Camping Midi-Pyrénées - looking for a campsite? Serach here! Forming a natural border between France and Spain, the Pyrénées is a European mountain range that offers some excellent camping opportunities. With several top quality campsites available and comfortable accommodations such as bungalow tents and mobile homes, book now with LUX-camp and discover what this spectacular region has to offer. Why camp in the Pyrénées? 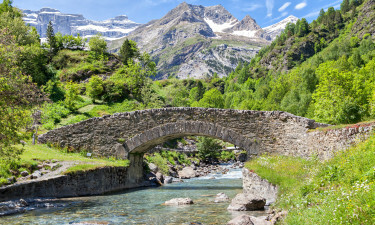 Older than the Alps, the formation of the Pyrénées dates back to the Palaeozoic and Mesozoic eras and the landscape is made up of majestic peaks, lush valleys, rushing waterfalls and stunning lakes. The area is perfect for ultimate camping luxury. Located beside the River Ariège, this fabulous luxury camping site has something to offer everyone. With children‘s clubs, a large pool, excellent entertainment, top quality on-site facilities and many leisure activities to try out, it is very difficult to get bored here. Stay in a fully-furnished luxury tent and take part in guided tours and outdoor adventures. Surrounded by breathtaking scenery, this holiday camping site has three outdoor pools, a spa including a sauna and top-of-the-range facilities. It is located only 800m from the historic town of Luz St Sauveur and very close to a National Park. Stay in a luxury tent or a fully-equipped mobile home and experience a camping trip of a lifetime. There are many lakes, rivers and reservoirs where visitors can sunbathe and swim. With several pebble beaches and superb picnic spots surrounded by stunning scenery, holiday-makers can lay down a towel and soak up the sun. Visit waterfalls hundreds of metres high, explore fantastic cave systems and hike through forests filled with a diverse array of flora and fauna. The perfect landscapes of this unspoilt region are astoundingly beautiful and with so many opportunities to explore the parks and nature reserves located in the area, a camping holiday to the Pyrénées will be unforgettable. 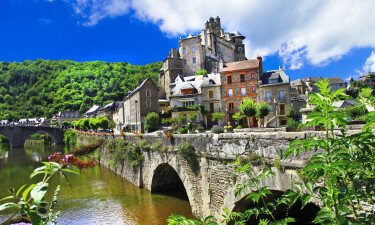 There are many exciting cities and towns to visit in the Pyrénées. Albi and Auch are architecturally outstanding with their red-bricked buildings, historic sites and Romanesque churches. Cahors is ideal for a spot of boutique shopping and visitors can take a relaxing stroll along the boulevards lined with shops and market stalls selling local produce and culinary delights. 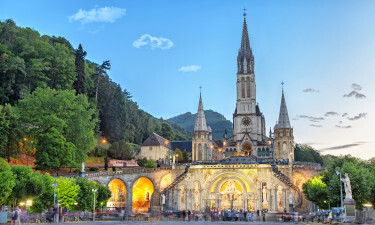 A trip to the inspiring city of Lourdes comes highly recommended as it is the second most visited place of pilgrimage after Rome. With a climate to rival the Mediterranean coastline, the summer months of July and August see temperatures reaching as high as 28°c during the day, with the night air pleasantly cooler. 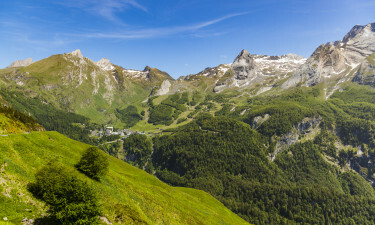 The shoulder seasons of spring (April to July) and autumn (September and October) still see temperatures of around 16°c to 24°c and although the peaks may be covered in snow, the weather remains glorious and provides holiday-makers with just the right temperature to enjoy hiking and exploring. Cirque de Gavarnie is a naturally beautiful site that features a circular ring of granite cliffs and mountain streams that fall to the valley floor. Grotte du Mas d’Azil and Grotte de Niaux, cave systems filled with prehistoric drawings and artwork, are also popular attractions. Visit the town of Foix and gaze up in awe at the imposing but impressive ancient castle that still stands above the town.